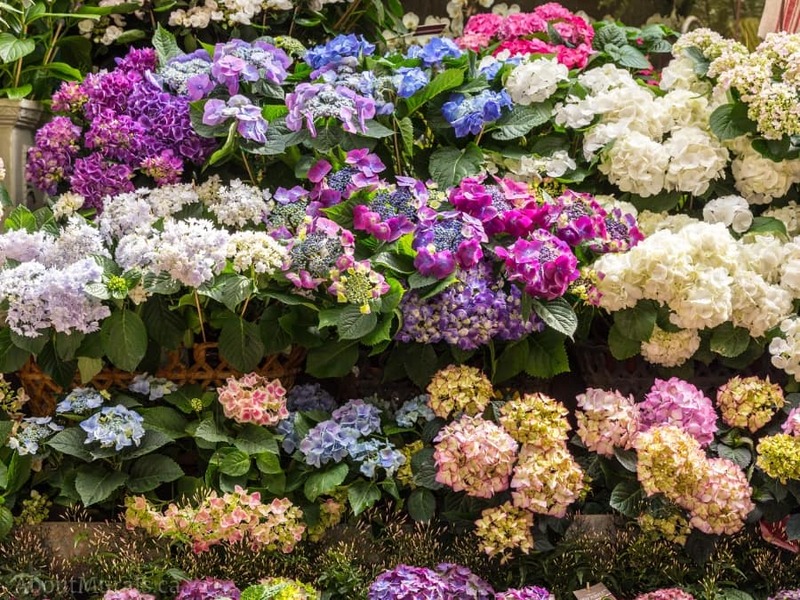 This hydrangea wallpaper is sure to put you in good mood! 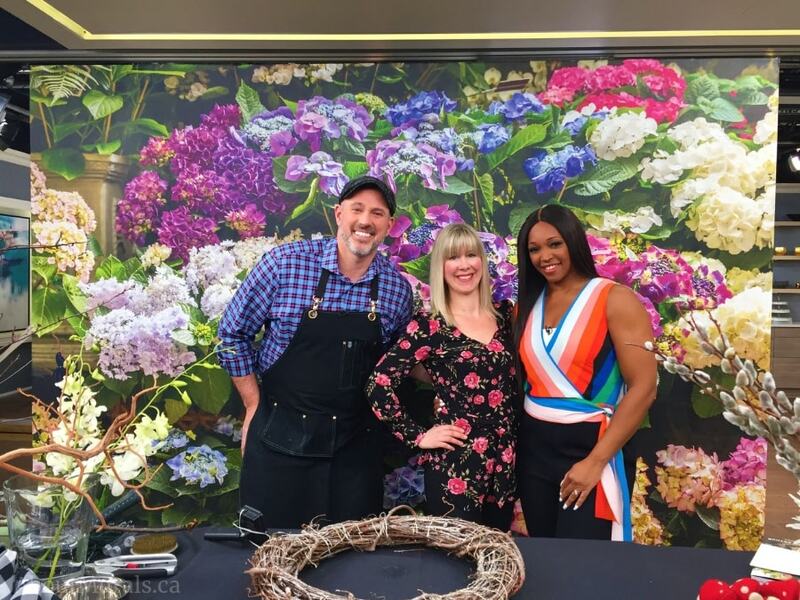 It’s the backdrop to Carson Arthur’s segment on Cityline where he shares his sneaky flower arranging tips using spring flowers (because it’s been a long @$$ winter and we all need a little hope, right?!). Hydrangea Wallpaper – it’s custom! 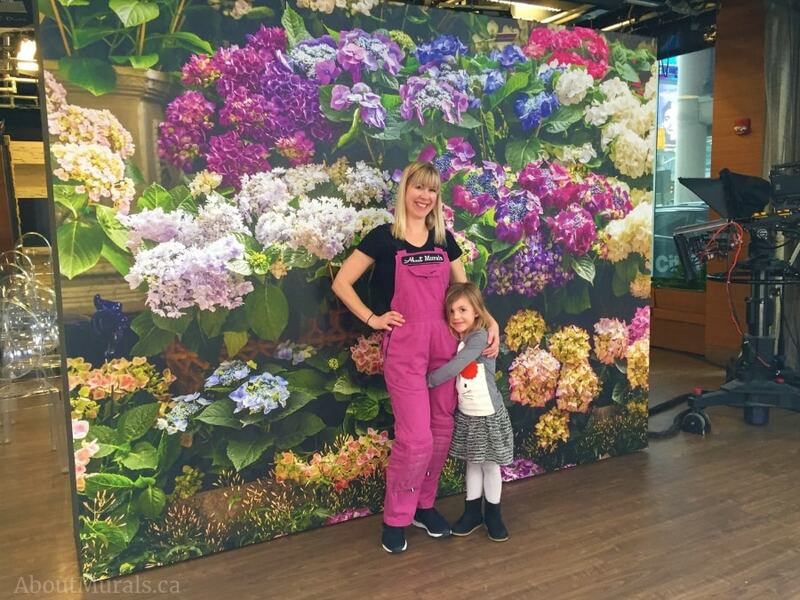 Although I sell ready-made flower wallpaper murals, this hydrangea wallpaper is a custom piece made just for Cityline. It’s super easy to do – just find a high resolution pic you like on a stock website like iStock and send me the link. I’ll let you know if the quality is good for large scale printing and put a quote together for you. It’s true! I always hang my wallpaper for Cityline and I offer installation services in Ontario, but most of my customers are the DIY type and hang their wallpaper murals themselves. I made a How To Hang video to help you along. This Cityline show was being taped on March Break and the Producer was kind enough to let me bring my daughter. She loved helping me hang the hydrangea wallpaper and now knows how TV works! The producers and celeb designers always do a fab job of designing the sets, but at the end of the taping, the walls have to be stripped down for the next show. All of my wallpaper murals are removable, on set or in your own home. Just pull it right off the wall – I made a video so you can see how! Join my newsletter community and you’ll see customer photos of my wallpaper murals in action and hear of all the latest deals.